Today we continue our insight into the experience of the Clipper Race supporters. 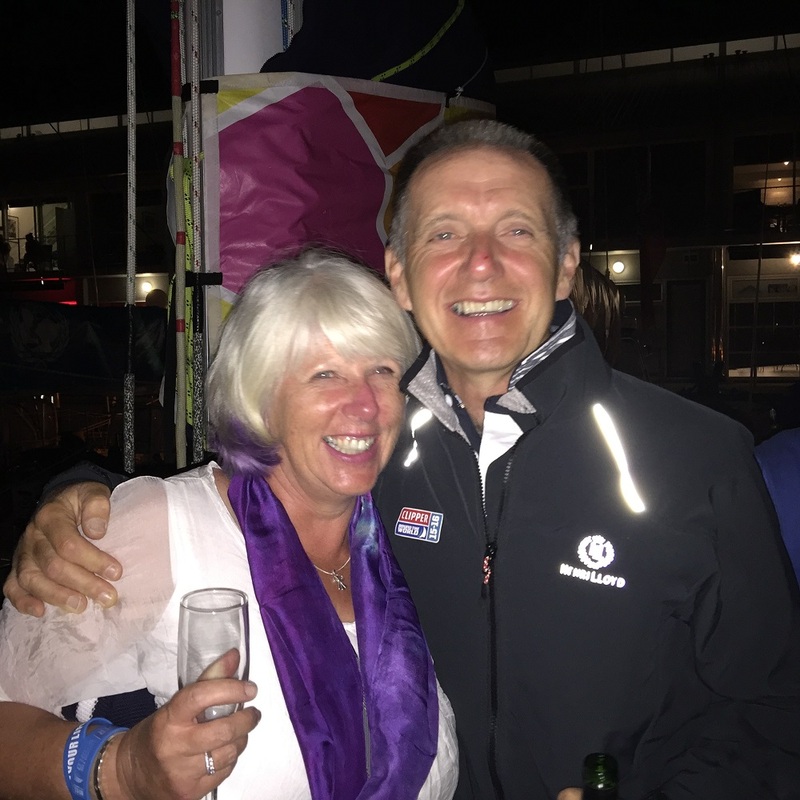 It wouldn't be a Clipper Race stopover without the familiar presence of Gabrielle ‘Gay’ Dowling, partner of Derry~Londondery~Doire round the worlder Tony Milsom. Always there, and always dressed in the team purple you can find Gay in prime spot on the pontoons, whatever time the boats arrive. Read their touching story of how the race experience has developed their commitment to each other, even after 18 years together. We're off to get our hats, ready for the big day. Big question is, will the bride wear white, or purple?? How important is it to be able to share the Clipper Race journey together? Gay: For me, as a family member, I am lucky enough and able enough to travel around everywhere to be there to see them come in, to give them all hugs from the people that can’t be there with them, and it is special for us both. I think it is important if anyone can get out to stopovers, it is important for their sailors too. It’s a tough experience and it makes a real difference to see a loved one. If I wasn’t out, I think it would be harder as I wouldn’t understand it as well. The Clipper Race isn’t just his experience now, it is a shared experience with my sailor, Tony, but it is also a shared experience for those that are travelling around, following our sailors. I’ve made some wonderful friends along the way with some of the other wives, husbands and partners. We can talk about it all together too which is crucial as no one outside of this bubble really understands. When we go home and we talk boats and sailing, and I don’t understand sailing at all, other people don’t really get it. So to have people around me now that do get it is really important as well. The other ladies and gentlemen out there following, we end up being a great support to each other. I have made very good friends with Noreen Hart, Mike Morgan on Mission Performance’s partner. I will go to say something and she will say exactly the same thing and we’ve just got this bond. The intention is that we’ll always stay friends now, but if we don’t we have really built something together and we’ve been through this journey together. In Da Nang we booked a hotel room together before the boats came in. They upgraded us and we had this huge double bed so we were a bit like Morecombe and Wise, sitting in bed with a cup of tea refreshing the Race Viewer on our IPads. It was great fun. Have you noticed any changes in Tony since the race started? Gay: Tony has changed a lot, on top of his two stone weight loss! He is a lot more open with his emotions. I think a lot of them are. He is far more open than he was and he is less shy and introverted. We’ve been through a lot actually too since the race started. By the end of this year we’ll have had a marriage in the family, Tony’s mum died unfortunately during the race into Da Nang, my first grandchild was born, and Tony's daughter is getting married just after we get back, plus we’ll be getting married next. Tony: Gay and I have been together 18 years. The Clipper Race has a lot to answer for now. It has been an incredible journey so far, though it has its highs and lows. The duration of the legs vary but they feel eternal while you are away. Those moments when you come into port are priceless really, when you see friends, family and loved ones. The whole experience just brings it home to you really, just how important your loved ones are. The race has definitely intensified that for me, and the feelings associated. I’ve come to the conclusion that there is more to life than just drifting along in a relationship, so I made the decision to finally propose to Gay. Hobart, on New Year’s Eve, felt like the perfect time to do it. I couldn’t think of a better place really, at the end of the Sydney Hobart which was such a great experience, surrounded by kindred spirits, and we shared the experience together. It was truly wonderful. The Clipper Race really has bought us closer together. Not by design but by circumstance. It is very hard to put your finger on why, but you do get these emotional highs, and you do get the lows, let there be no doubt about that. But there is nothing better than coming into port and seeing someone you know, heralding your arrival. Whilst that may sound a little self-centred, it is not intended to be that way. We are fortunate that she is able to be here and lots of fellow crew members do not have that luxury but Gay has actually become the proxy relationship for us all and everyone looks out for her. We see her grey hair and we hear her voice when we come in and it is fantastic. It’s as if she is one of the crew really. What made you decide to sign up for the Clipper Race in the first place Tony? Tony: I definitely signed up to the Clipper Race for the sailing. I came late to sailing, about eight years ago, but I always raced. I’m a racer and that’s all I’m interested in really. It coincided with my age and the time in my life. It was a case of capacity, being able to fund it and pick a time where my body could still handle it. So I did at 58. I had an ambition to sail long and far, on my own boat originally but Gay doesn’t sail so this is a compromise in many ways. I get to sail around the world and get it out of my system, and it is less expensive than buying a boat and doing it myself. It is still reasonable expensive to do it, but it is definitely less expensive than the other option. How important to your experience has it been Tony to have Gay in so many ports? Tony: It is one of the most important parts of all to me is that Gay is able to participate in this too, in a very big and intense way. She is not just at home hearing about it from me, she is in every port and part of the wives and girlfriends group and part of the friends and family group, so we’re getting as much out of it as we both can, and loving every minute. I didn’t expect Gay to be here in China but I had said before I left that even if she could come for just one or two days, just do it, not knowing if it would happen. So when we arrived, and Qingdao was there in all its glory, the huge city that it is, I was looking for this grey flock of hair. I saw a blue coat and a white or grey top and I thought that could well be here. Anyway, this person was up and down the steps and I thought ‘oh that can’t be Gay, there is too much agility going on’ and my heart did sink at that point and I thought oh no. And when we came up to the pontoon it was just bedlam, a mass of humanity was there waiting and all these drums were banging, but amidst it all, must be like the birds when they hear their fledglings, I heard this voice. And I just honed in on her and there she was at the front of all those people, waving like hell. My heart was so uplifted and it was joy unbounded really. There was a tear in the eye, and it was over whelming really. I will be eternally grateful for that, really. Gay: He would never have said this eight months ago. He has become a lot more open with his feelings and this is what the Clipper Race has done to him. It’s great. When Tony first mentioned doing the Clipper Race, I said ‘do it all dear’ and I didn’t really think about it. 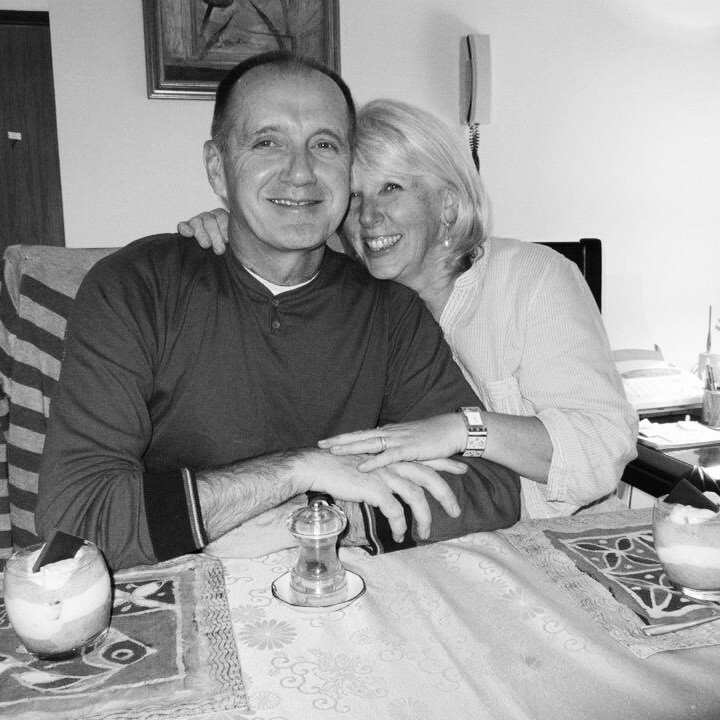 We were living abroad at the time and I knew it meant we would come home. But as it got closer and closer I did start to feel a bit sick about the whole thing. I didn’t ever like travelling before really, and look at me now, I’ve been to Rio, Cape Town, all round to Australia, I even went to New Zealand on my own, Vietnam, China. It has just been amazing but to share it is the most important thing. I know some people aren’t able to afford it or get the time away from work, and I also know some people haven’t wanted to come out to visit their other halves as it might be too difficult emotionally for them, everyone deals with it in different ways. But for us it has been wonderful. Our kids are following, and we have our newest member of the supporter team with my week old granddaughter. Tony: It is a family affair really. It is not just us two and I’m sure it is the same story for many, many other families. You don’t have to fly out to ports to get addicted to the Race Viewer. The Clipper Race provides a huge amount of data, blogs and information on the website and social media to keep people informed and included and people do feel like they are part of it, in fact at home people often know a lot more detail about the race than we do on the boats! Sometimes they are talking about things when we get in that we don’t even know about yet! Completely in tune with what’s happening and that’s something I didn’t expect either. It is a great feeling and I’m glad that other people are able to share in our experience too. Many people say the race is a life changing experience. Is that true for you both? Gay: It has been a life changing experience for both of us. I’ve met so many people from all different walks of life, from all over the place and some of these people will be lifelong friends now, and when we do get married, it is going to be a hell of a party! We just need to find a venue big enough, and of course everyone will have to wear a bit of Derry~Londonderry~Doire purple. It has been wonderful. Tony: I’d highly recommend it. If anyone has an interest in adventure, adrenalin rush, and wants to do something different, just go for it. It is going to be hard to surpass this. I think Nepal is high on my list next so we’ll see where we go next. But you do get an appetite for this kind of activity. If you are an adrenaline junkie it can be addictive. Have you talked about what is to come after the race ends? Tony: We know it can’t go on forever. Chapters close and even the best adventures can go stale. I wouldn’t want it to go on forever and I’ll want it to come to an end at some point, and it will have run its course. So we’ll be ready to close that book and open a new chapter and if that chapter matches it, but it is going to have to be a mighty experience to compare and contrast with what we have just been through. Personally our lives are going to change big time anyway because we will be just coming back from living abroad for ten or eleven years, we have a new grandchild, Tony’s daughter is getting married, and we’ll be planning our wedding. So there is so much going on for us personally in our own lives, that there will be lots of positive things to focus on to get our heads around. Gay, what have some your highlight moments been as a Clipper Race supporter? Gay: There have been two standout highlights for me in this journey so far. The first was when they came into Rio. It was exciting seeing the boats come in for the first time. There we were shouting and screaming and we saw the crew notice us, and then they started waving back, and people on the crew that I didn’t know were getting off and hugging us and saying thank you for being here. We didn’t know who would be here to greet us. Then also in Sydney when the fleet did the parade of sail and they went past us as we were stood outside the Opera House, and there was about ten of us I suppose, all in our different colours, and we started shouting. And they looked, they are all like meerkats I suppose. Once one turns to look, they all turn. I think they were supposed to be having their photos taken at the time but they all turned around and were waving at us which was great. It makes us feel valued too. Are there personal challenges that come with it too as a supporter? Gay: It is hard for us supporters. We see what comes up on the Race Viewer, and sometimes the skippers might be doing something tactically that we don’t understand or know why they are doing that but we have to trust them. We can read a blog or see the weather reports but we worry about our sailors of course. I don’t understand sailing so I just think, wow those are big waves, or the wind is going this way, isn’t that a good thing? But it is hard. Especially when something happens. Tony’s mother passed away recently. We had been able to talk about it beforehand and he had told me that he didn’t want to know about it until he got into land as there was nothing he could have done. So things like that are hard, and when you want to talk to them about something you can’t, but that is where it is great that you can lean on the other wives and girlfriends and send each other a message, and we’re there for each other too. Tony: One philosophy I’ve always tried to live by in my own life is that life is finite. You only get one shot at it. You have to make the most of it while you have it. I’ve always tried to instil that in my kids. Go out, take every opportunity that you can. Enjoy life and this is one big piece of my enjoyment. I can’t think of anything that has surpassed it really. It will linger long in my memory. 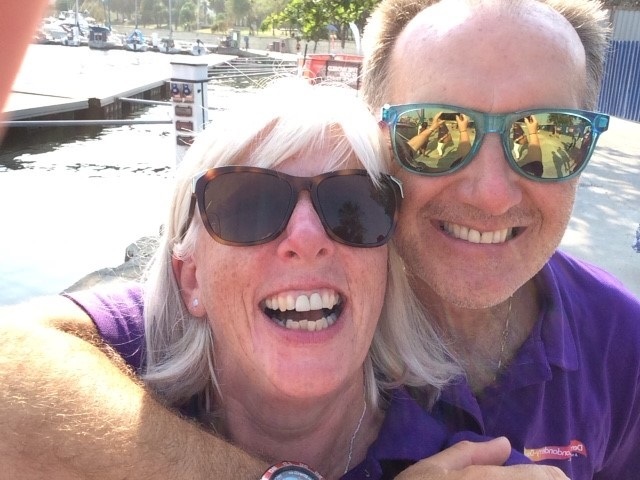 As the crew take on the longest leg across the Pacific, we will be catching up with a different supporter each week to hear their side of the experience. 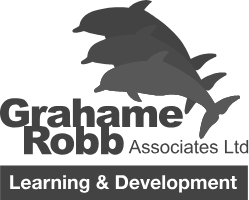 Next week we will hear from Phil Robertson, father of Adrian on LMAX Exchange. If you want to tell us in the comments section on Facebook 1. Who you are supporting 2. Your relationship to them. 3: A little message of encouragement, we will send it to the boats on the day they cross the International Date Line, and help spur them on during the longest day of the longest race. Tune in to catch Episode 3 of Race of Their Lives on Bloomberg TV in Europe this Saturday and Sunday at 1200 BST, Channel 502.